The guidebook for any budding time traveller, this book takes you on a journey through time. Each page is bursting with pop-ups, pull outs, activities, rich drawings and weird and wonderful facts. Much like ‘Dragonology’ and ‘Pirateology’ this book is somewhat of a novelty, yet artfully compiled. Filled with intricate details ‘The Time Traveller’s Journal’ fits into the ‘ology’ book genre that is so popular with younger readers currently. 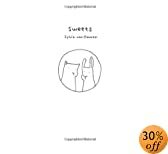 Written by Ruth Redford, and presented as ‘Prospero Hermes’ Journal, the book mixes diary entries with factual information from the dinosaurs to life in space. While the first glance might dismiss this book as a gimmick, there is no doubt that Rachel Clark’s design is enthralling. Indeed, there was many an argument when this book arrived in my book corner; everyone wanted to use the mirror to decode the secret message or read the pull-out newspaper documenting the Titanic sinking. A firm favourite, making history compelling. 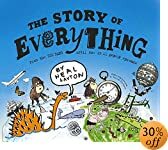 Neal Layton’s ‘The Story of Everything’ is just that. This vibrant and dynamic pop-up book charts the history of the universe from the big bang through to the earth’s conception and the gestation of first life ‘ underpinned by a brief explanation of Darwinism told through the inclusion of a miniature edition ‘Fish Fins and Fings’. The dominance of dinosaurs and their eventual extinction is relayed as too is the evolution of mammals and more latterly, a double-page spread about apes including those with bigger brains! 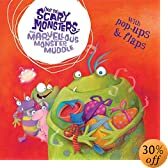 A welcome pop-up edition of one of Hodder’s ‘(Not so) Scary Monsters’ series, ‘The Marvellous Monster Muddle’ opens as Malcolm, who loves to give presents, sadly has none left to give. So it is that lolloping, puffing and peering he sets off on a quest to find new presents. Finding a treasure chest of potential gifts, Malcolm delights in giving these out to his friends along with sloppy kisses. Each of the presents, however, serves to cause a number of frights as, using the gifts as fancy dress, the monsters are no longer able to recognise one another. Laughing at the realisation of who each monster is, Malcolm is delighted that his gifts have brought so much mirth and merriment. Punctuation is sign posted as building blocks in this, clever and compelling guide to its basic usage. This motif forms the foundations of the book with subtle illustrative reference to the three little pigs and the house of straw at the beginning of the book to the bricks and mortar of the four-tiered, three-dimensional finale at the close. Lift the flaps and pull-tabs help to actively engage readers in the process of proper, standard, punctuation. This begins with the basics of starting each sentence with a capital letter and ending it with a full stop. 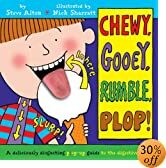 A practical guide to the use of commas is then presented, this is consolidated through showing some of the humorous outcomes that their neglect can cause. Question marks, exclamation marks, semicolons and colons, speech marks, and much more are covered along with the hugely abused apostrophe ‘ a quiz is presented to help clarify the rules of real apostrophe usage. Kate Petty and Jennie Maizels have managed to make a subject that can often be tediously repetitive and monotonous truly engaging. With the pop-ups and paper engineering, this is a book that both readers and writers will delight in and will doubtless wish to return to. Assuming the guise of Hector de Lance, readers become caught in a quest to rescue their assumed father, Sir Geoffrey from the clutches of the French Knight Sir Denis d’Oc who although allowing Sir Geoffrey to abode in Castle d’Oc itself rather than in the dungeon won’t abide releasing him until a ransom of ’40 is paid. Sir Geoffrey, however, has a cunning plan to teach his son to become a knight, how well will you fare? Following the high production values in terms of print, illustration, paper-engineering, design and lay-out, that Templar’s ‘Ology’ books have become renowned for, ‘How to be a Knight: A Squire’s Companion’ lays-out the mediaeval world of knighthood and chivalric values. Details on chivalry, on armoury, heraldry, training, questing and battles are provided. Adding colour and detail to these are lift-the-flap sections, a complete game, Squirefight, with all the pieces needed to play, a rule book on jousting a pop-up showing the strongholds of the castle gate means and devices for making an attack on enemy castles, a mini bestiary of creatures that might be encountered when questing and a short retelling of the Sir Gawain and the Green Knight. 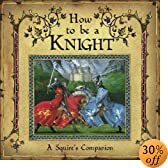 A book that enables such active participation successfully transports readers through time to live and breathe, learn and battle in the age of knights and chivalric honour. The over-arching story provides a satisfying cohesion to the work.